Now that Spring is here, my phone is beginning to ring a bit more as people realize they simply can't live any longer with their existing, unattractive yard. And while I really appreciate the consideration, unfortunately about half the time my callers are unhappy to hear that getting what they want in the timeframe they want it will take a bit more than a phone call. Know which professional you need. Landscape designers, architects, contractors and gardeners all have different strengths, and are appropriate for different jobs. Take the time to learn how they differ, and decide which is right for you before you invite them out to your site. Otherwise you'll waste time doubling back to find the appropriate pro. Know what you're asking for. Do a bit of homework: What's the size of the area to be landscaped? What are some of the ways you envision enjoying your new yard? Have you ever seen any other yards or gardens (public or private) you liked? Take pictures, tear pages out of magazines, photocopy books. Do whatever it takes to clarify, for yourself as well as your designer, what you've got and what you want. And for best results, do it before you and your pro agree on a direction. Sharp turns are painful for everybody. Know what you can spend. You didn't shop for a car without a budget. You didn't look for a house without a budget. 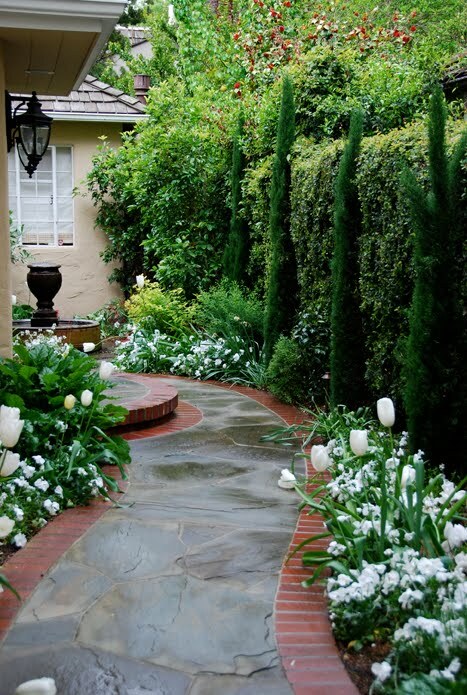 So don't start planning your landscape without a budget. "But we want to see how much things cost before we commit to a budget!" That's a landscape designer's dream: if you'll pay me to produce idea after idea after idea until we reach that magical place where ideas and budget intersect, I won't need another client this year. But wouldn't you rather spend that money on the actual construction, not the pretty drawings? Just talk it over with your partner (and your financial adviser and your loan officer if necessary) and decide on a figure. Then let your pro help you figure out how to get the biggest return on whatever you invest. Know when to stay out of the way. Once the design process has begun, most home owners feel pretty excited that things are finally moving forward. We get it! We love what we do, too. But looking over the designer's or contractor's shoulder (either figuratively or literally) while we work, designing your yard at the same time we're designing your yard, shopping for plants or hardscape materials before the design concept has been approved, or hooking us up with your friend's cousin who's studying for his contractor's license just is not helpful. Unless, of course, we've agreed beforehand that it is. Which we probably haven't. Know your limitations. If you're at all handy, you probably can do some of the landscaping yourself. And if your contractor agrees that some of the work will be done by you, great! But before you start, consider whether you're really going to save money by doing it yourself versus giving the job to someone who makes their living doing it all day, every day. Are you really that good at sizing and fitting irrigation pipe? Do you know how to put a plant in the ground to prevent it from going into shock? What's the worst that can happen if you don't wire your landscape lighting properly? I'm not saying you can't do any of these things; just that if you, say, kill that plant, you're on the hook to replace it. If your irrigation is uneven, you have no one to point at but yourself. Just because you can… doesn't mean you should. Know your pro. Don't, just do not, hire an unlicensed professional to do the job of a licensed one. Don't hire a landscape designer (unlicensed) to design a hillside deck. Don't hire a gardener (unlicensed) to set your stone. For that matter, don't hire a landscape contractor (C-27 license) to install your gas line (C-36 license). Hell, I'm not even a fan of hiring your gardener to install your irrigation. Check the contractor's license status. Check their insurance. If you know they've got a crew, but the state licensing board says they have no employees, they're not playing fair, and that hurts everyone. Sure, unlicensed, uninsured contractors are a lot less expensive than licensed/insured ones. Right up until something goes wrong. Chances are, even in This Economy, your landscaping is going to cost more and take longer than you expect. But there's nothing that says you can't get your money's worth. Before you pick up the phone, remember: a little preparation goes a long way toward getting results you'll love!